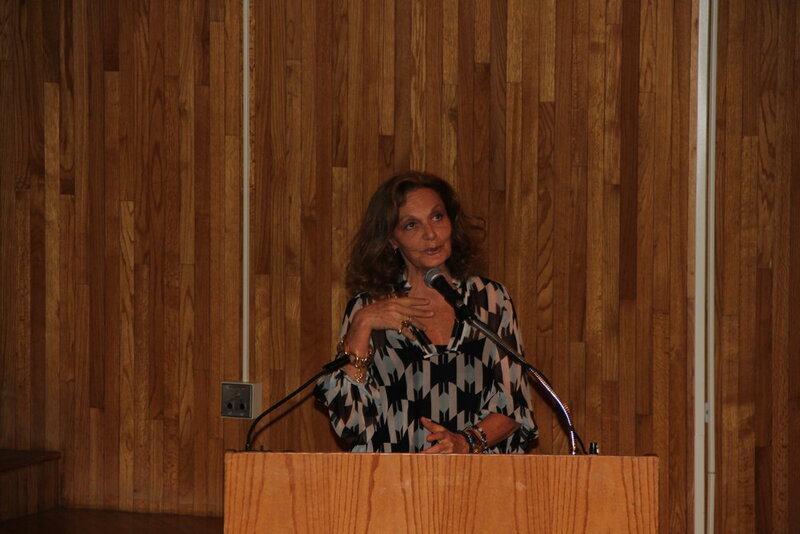 Hearing Diane von Furstenberg, designer, philanthropist and President of the CFDA speak at the Museum at FIT's Fashion Culture Programs was one of those fashion moments that made you proud to be in the industry. She spoke about her beginnings, her affiliations today and gave us her words of wisdom that were so truthful, you couldn't help but want to run out and build your own story. The thing about Diane is that she knew the type of woman she wanted to become and the woman that would wear her clothes. She joked that even at age 12, she already was one. This "woman" became her customer and the platform for her brand which still holds true today. You can see this in her first ad where she proclaimed the famous line, "Feel like a woman, wear a dress" and even in the current DVF ad campaign. This unfaltering stance on her target, has no doubt helped to establish and give meaning to her brand throughout the years. Diane admits that she didn't know what she wanted to do, but when she started interning for a designer in Italy, she was exposed to everything from production, understanding color and fabrics and ultimately learning a craft. When she was ready to begin her line, she worked in that same factory after it closed to produce samples. Shortly after, she came to New York with these samples and was able to present to Diana Vreeland. She was able to get on the Fashion Calendar to start showing her collection and within a few years, she had become a household name that was synonymous with the cotton jersey "wrap dress" that she introduced in 1974 and is still her signature piece today. As President of the CFDA, she has helped foster a community of initiatives for both young and established designers like scholarships, protecting design and business development along with consumer programs like Fashion's Night Out. You can also learn more at the Museum at FIT's exhibit, IMPACT: 50 Years of the CFDA going on now. She's also involved in her own philanthropic efforts like Vital Voices, an organization empowering woman leaders and social entrepreneurs and with the DVF Awards where she recognizes women that have impacted social causes. And, in it's third year, the Proud To Be A Woman campaign, in conjunction with International Woman's Day is going on now to help support women around the globe. Her advice for designers was simple: invest in developing relationships with factories so they can help you produce your product and help you become successful. Then, for "young people" whether you are in fashion or not, she professed these steps: 1. Understand that the most important relationship is with yourself 2. Dream of where you would like to go 3. Be real with yourself about these dreams and 4. Got for it! Get inspired at DVF and follow Diane on Twitter. Yes, she tweets and when you see "Love Diane," you'll know it's her. So What Really Is The CFDA Incubator Program?